Raceland is located in the southern-most part of Louisiana, offering visitors a chance to experience the beautiful Gulf of Mexico. 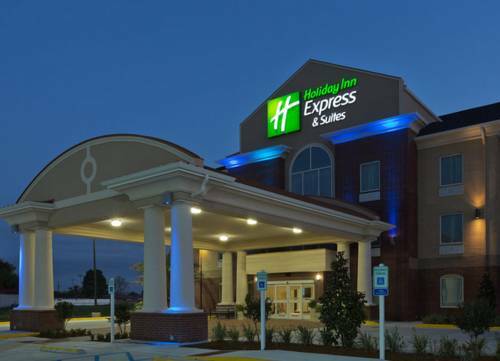 The Holiday Inn Express Hotel & Suites Raceland Hwy 90 provides easy access to the area's seashore fun, ensuring a pleasant stay.Thanks to an on-site business center, corporate travelers can stay in touch with the office and complete business-related work with ease. Furthermore, several businesses, like Bollinger Shipyard, Oschner St. Annes Hospital, and Grand Isle Shipyard call Raceland home.While at our hotel, Raceland guests should travel to Grand Isle State Park, which is not only home to the annual Tarpon Rodeo, but also offers beachfront fun, including swimming and fishing. If you're looking for a day on the water, book a fishing charter and experience deep-sea fishing at its finest. Bayou Lafourche Area Convention and Visitors Bureau is just a short drive away, which holds all travel information. Golfers will appreciate our proximity to La Tour Golf Club. If youre looking for a little excitement, only a 45 minute drive east takes you to all the fun, culture, and diversity of New Orleans.We're proud to offer free high-speed Internet access throughout our hotel's accommodations. Raceland visitors can also "Stay Smart" and begin the day with the complimentary Express Start Breakfast Bar with hot and cold items. We look forward to seeing you soon! There are reportedly so many supernatural hijinks here at night that it's a wonder that anyone gets any sleep. The history of mixed drinks. Two hundred years of bartender innovation! The showpiece of the Southern Food and Beverage Museum.